Omaha will have Mitch Hahn (#44) back next year after missing much of the year with injuries. The Omaha men’s basketball season has come to an end. Omaha concluded their season on Saturday night when they lost to the South Dakota Coyotes in the quarterfinals of the Summit League tournament, by a score of 87 to 73. Not expected to compete in any secondary post-season tournaments, the Mavericks will finish with a record of 9-22. With a score to settle after their most recent game (a loss to South Dakota State), the Coyotes leapt into the fray immediately with a 7-0 (and later, a 15-2) run to open the match. Omaha made a 11-4 run to end the first half, bringing the score to 46-28. South Dakota put distance on the Mavericks in the second half to maintain their lead and win the contest. The Coyotes led for the entirety of the night. As per usual, Zach Jackson led the Mavericks in scoring with 26 points, shooting 60 percent of his field goals and all seven of his free throws on the night. Jackson also added six rebounds and a steal. Daniel Norl scored 11 points on the night, including Omaha’s first five points of the game, and led the team with two assists (tied with Ayo Akinwole from the bench). Lamar Wofford-Humphrey (10 points) also garnered six rebounds (4 of those on offense), tying Jackson for the most on the team. Mitch Hahn shot one-for-nine on the night, with four boards, an assist and a steal. While Jackson led all players in total points, South Dakota played as a unit, bringing three players into the double digits. Matt Mooney led the team with 20 points, adding five rebounds, an assist and two steals. Nick Fuller, Trey Burch-Manning and Brandon Armstrong also scored in the double digits with 17, 14 and 11 points, respectively. Austin Sparks led all players with eight boards on the night, while Triston Simpson gave seven assists. South Dakota ended with four less turnovers than Omaha (scoring twice as many points off of turnovers as Omaha as well), and five more assists. Omaha has only ever won one quarterfinal game in the Summit League tournament (out of three eligible seasons), coming last year on their way to the Summit League Championship. 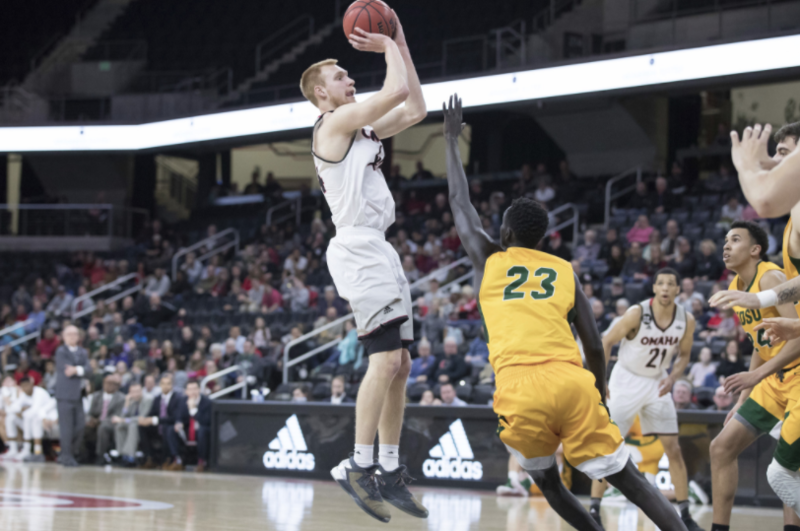 The team lost to South Dakota State, who, led by Summit League Player of the Year Mike Daum, defeated the Mavericks when a last-second shot missed from behind the arc. Daum again won the league’s Player of the Year award. Omaha’s season featured 18 road games (due to the occupation of their home arena by the U.S. Olympic Curling Trials) across four time zones, including opponents such as Oklahoma, Kansas, Louisville and Texas Christian University. The team battled injury all year, with the extended absences of forward Hahn and center Wofford-Humphrey. Now, the team will prepare for a rough offseason – senior starters Wofford-Humphrey and Daniel Norl will graduate, leaving significant holes to fill. Jackson is expected to return next season, after being named to the All-Summit-League second team in the 2017-18 season.